In recent years my husband and I have become enamoured with Scotland and have taken many family holidays there. I find it soul cleansing to go across the border with my back to England and feel a different pace to the places we visit. One of the reasons we love the area is that it’s stuffed to the gunnels with standing stones, cairns and castles. My husband doesn’t really read novels, not in the sluttish way I do, one after another with nary a look back. No, he devours history books and it’s one of the reasons I love him; he has a deep interest in understanding the past and I think it adds to his ability to make sense of the present. Anyway, I digress. Going for a walk to find an old bit of stone is something we really enjoy and it thrills me to see my eldest enjoying it too. Smallest is getting better at just coming along for the ride and that is in part the point of this post. Up in Scotland again, this time on the Moray coast he had seen Boyne Castle on the OS explorer map so we set off to visit it. Little did we know that it was very hard to access and in a deep state of ruination. Our first attempt was seen off by rain and a loss of confidence about which vague path to take through a field. 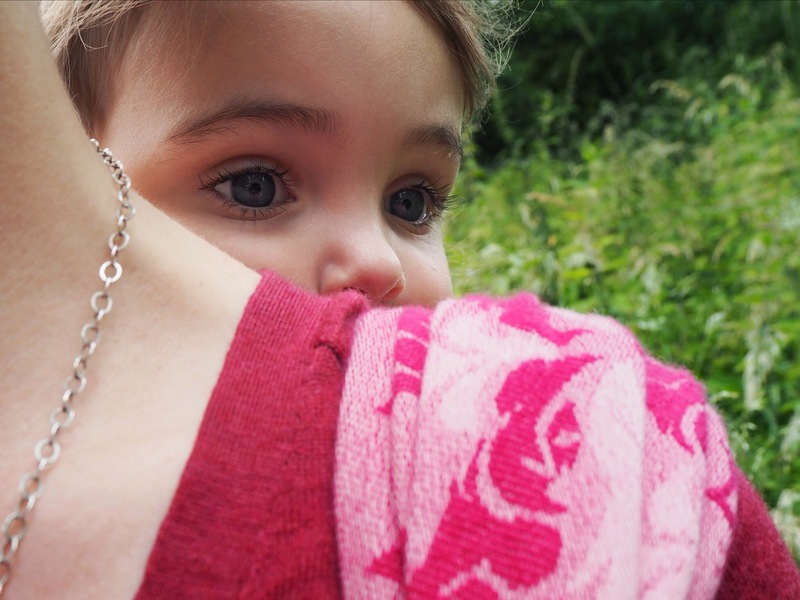 I’m also a little nervous about the tick factor in long grass and my eldest and I were not dressed for a ramble. We gave up that search but I’m still rather chuffed that I managed to dismount Smallest from a super soft merino wrap (Sling Studio Mr Pink) in a torrential downpour with hardly a splash on it. It was maddening though because peeping through the trees we could see one of the remaining towers and we had gotten so close. 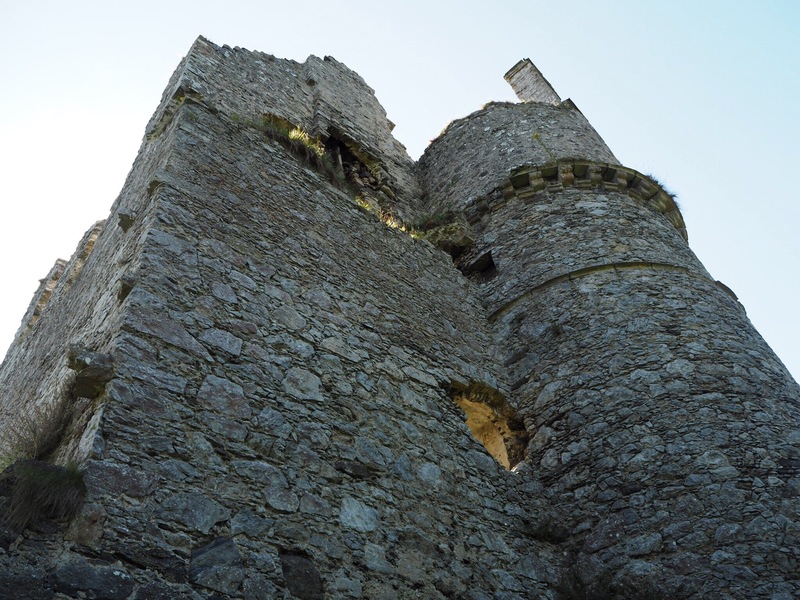 I really, really, wanted to get to Boyne Castle and it brewed on my mind for days. For me it’s the romance of a ruin. The unnoticed tumbling to earth of what was once a grand structure that included orchards and walled gardens. Boyne is not ticketed entry, there is no on site expert to tell you about each room, it’s just a lonely building in decay surrounded by beautiful hills and a river. We waited until it was forecast as a reliable summer’s day and retook the journey. This time we had covered our legs and I had my Artipoppe Argus Tealio with me. I love Tealio; partly because it came from someone I am really fond of (hello Tessa) so it contains seriously good vibes, and partly because it’s my beater wrap. The one I don’t mind if it gets trodden in mud and caught on brambles. I just wash it, repair it and wear it again, no sweat. It’s a brilliant blend of high linen content with a smattering of bamboo which makes for a solid carry that doesn’t dig. Tealio is my ruck tied at the shoulder wrap, the we’re in business wrap, the one that will hold Smallest up high and not move a millimetre wrap. Good for keeping her away from stinging nettles and any ticks. We retraced our journey, wading through undergrowth and dodging stingers, and took the right path that led up to a gate. 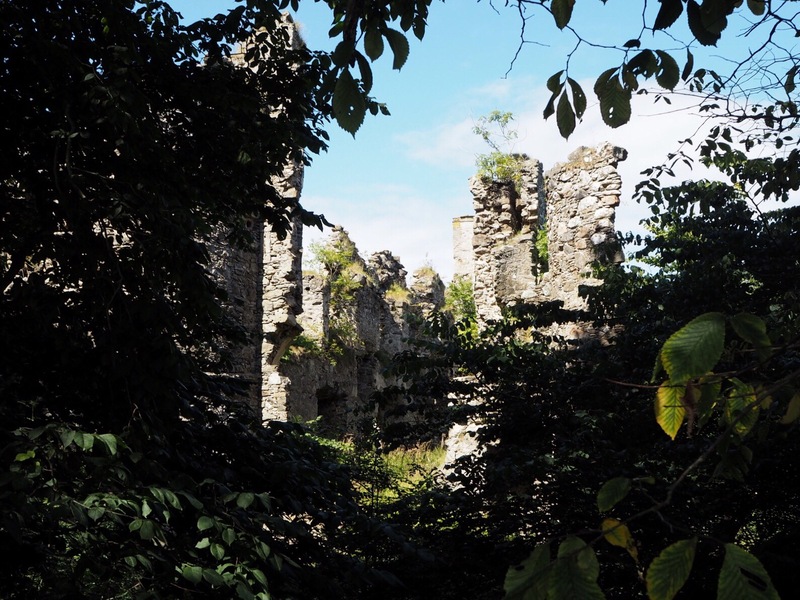 Carefully picking our way over large stones, presumably part of the exterior wall, and looking through the trees, we came upon Boyne Castle. I let out a deep breath, the breath that was held in because I was so worried we wouldn’t make it. But we did. Smallest had been happily on my back “reading” a page of stickers. She made no grumbling sounds and did not squirm for the whole time we were there. Boyne is stunning and I feel very grateful to have seen it. 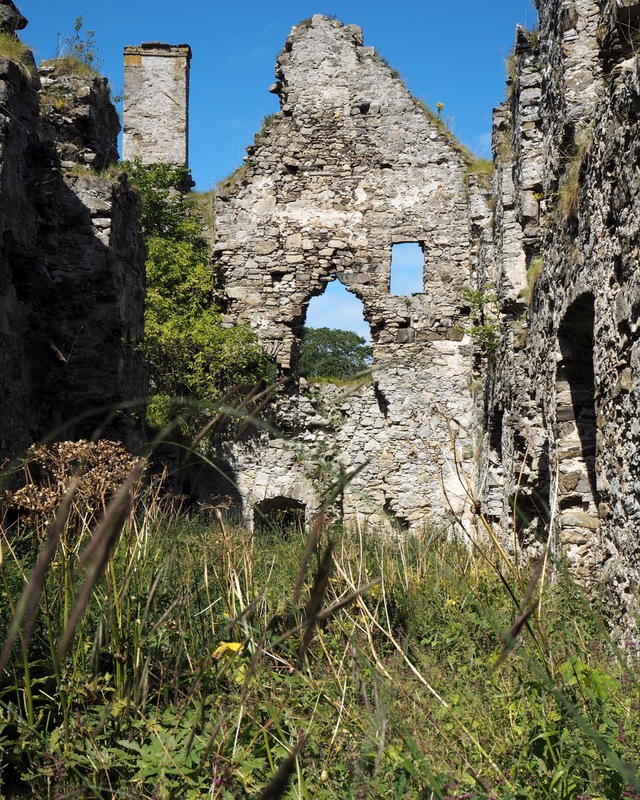 We passed vaulted cellars with only one that had fallen in, looked up to yawning windows that had been robbed of their lintels, noticed gun holes and the spaces where steps had once been up now tumbling towers. I am no castle expert so I point you to this walk report that describes the place perfectly. Throughout all of these explorations I had been perfectly comfortable carrying Smallest in Tealio, it performed in such a stellar way. 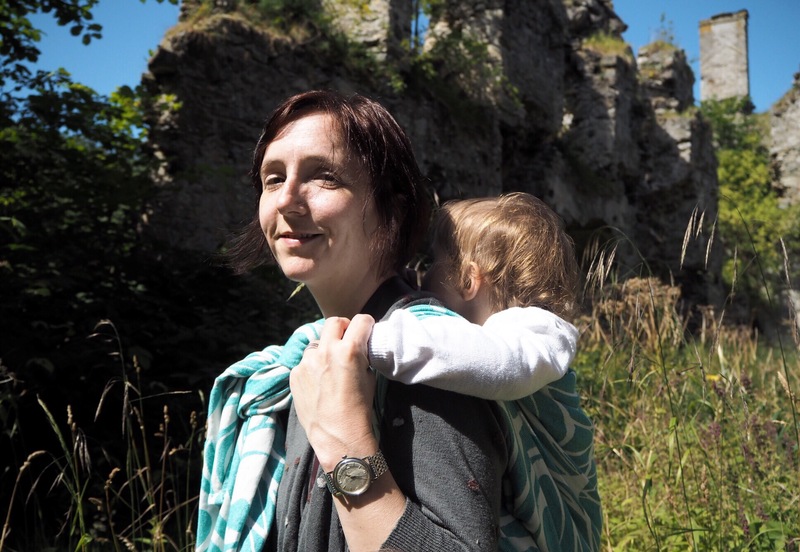 So in part this is an ode to Tealio and babywearing because without being able to carry my toddler reaching such a magical place would have been impossible. There was a liberation in this journey as my eldest is sure footed enough at 5 years to make it herself so it was the first time that we, as a family, had gone on a proper exploration. I’m impatient by nature so I can safely say I wouldn’t have wanted to wait another 2.5 years to be able to do fantastically fun things like Boyne castle. 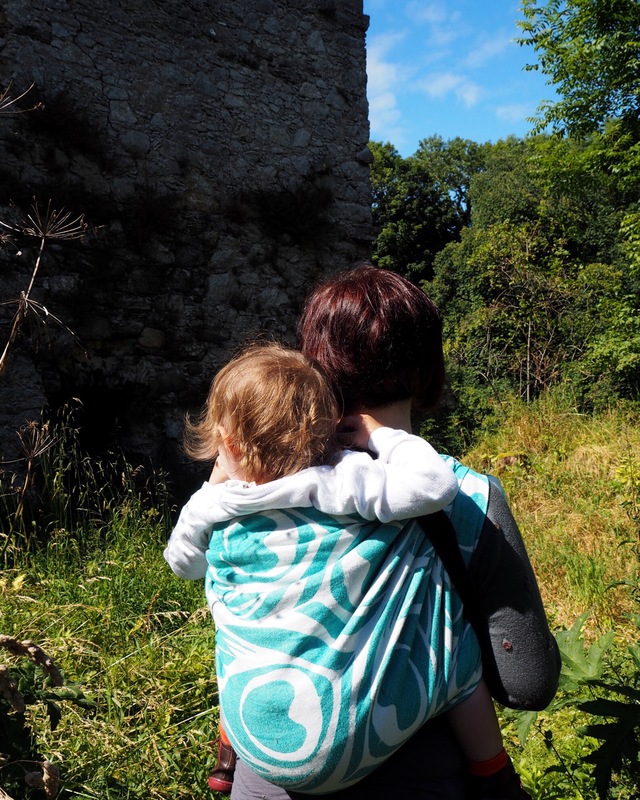 Babywearing means we can introduce our girls to the intriguing and exciting world of walking to new places and exploring hidden gems like Boyne. This is a time when their minds are wide open to the possibilities and relics that nature has benevolently left standing, waiting to be found. For now.